JERUSALEM, Friday, May 27, 2011—Standing at the site of King Hussein’s unfinished palace in east Jerusalem, MK Tzipi Hotovely (Likud) told approximately 140 English-speaking Israelis that Jerusalem needs to be built up and its borders expanded, as part of a tour of east Jerusalem organized by Likud Anglos in honor of Jerusalem Day. The Member of Knesset also discussed how the use of Arabic names for various Jerusalem neighborhoods gives people the impression that these are very far from Jewish neighborhoods, and can therefore be easily severed. In fact, Hotovely noted, Jewish and Arab neighborhoods are often only a few meters apart. Hotovely said she plans to introduce legislation in the Knesset this session that would create a “Greater Jerusalem” metropolitan area by expanding Jerusalem’s municipal borders to include places such as Ma’aleh Adumim and Giv’at Ze’ev. 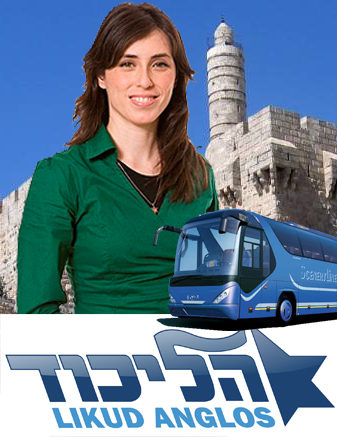 Hotovely pointed to undeveloped areas and hills as examples of land that should be incorporated into Jerusalem’s municipal borders and then developed as part of the city. and Keep Jerusalem's Rafael Cohen, at the Mount of Olives. The “Greater Jerusalem” plan (“Yerushalayim Rabati” in Hebrew) is backed by a group of Jerusalemites called The Committee for a Greater Jerusalem, led by Jerusalem resident Aryeh Hess. In the same 1995 speech, Rabin also stated that he did not envision a Palestinian state, but “an entity which is less than a state, and which will independently run the lives of the Palestinians under its authority.” In an interview with Time magazine as well, Rabin decried the establishment of a Palestinian state as a danger to Israel. Introducing Hotovely, Daniel Tauber, chairman of the Likud Anglos Jerusalem Chapter, noted the danger a Palestinian state would pose to Jerusalem, as it would surround Jerusalem on three sides, if not divide the city. The promo picture for the tour. Tauber praised Hotovely for fighting for the Land of Israel. Tauber also praised Prime Minister Benjamin Netanyahu for proving that Israel can say “no” to the United States and the international community, yet still maintain the unique relationship between Israel and the U.S. The unfinished palace from which Hotovely addressed participants is believed by many archeologists, including the famous William F. Albright, to have been built upon the ruins of the palace of King Saul, the first King of Israel. All that was built of Hussein’s intended palace was the frame and roof of the two-story structure, as well as the foundation of a smaller second structure a few meters away. The palace, located at the top of a hill, provides a view of Jerusalem and its surroundings. Construction of the palace was interrupted indefinitely by Israel’s conquest of east Jerusalem in 1967. Today the Jordanian royal family still claims ownership over the property. 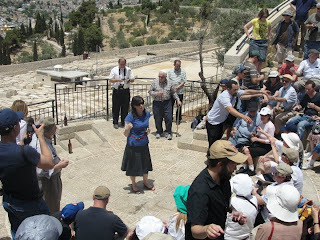 The site was one of several stops on the tour, which took a caravan of three buses of participants through the eastern neighborhoods of Jerusalem, stopping along the way at the Atarot checkpoint; Pisgat Ze’ev; the Mount of Olives, where Hotovely toasted to the future of Jerusalem; and finally the tomb of Shimon Hatzadik, in the neighborhood of the same name that borders Sheikh Jarrah. The tour was led by tour guides from Keep Jerusalem, a non-profit organization that gives tours of eastern Jerusalem with an aim to educate people on the need to keep Jerusalem united. Keep Jerusalem’s guides provided participants with details of Jerusalem’s legal history, the areas visited, and the struggle to keep east Jerusalem under Israeli sovereignty.